The blog post article was emblazoned with a picture of a fist holding a roll of twenty dollar bills. The title of "Eight Signs of a Wealthy Mindset" was designed to grab your attention. Seemingly this could have been from Forbes or Business today but instead it was from the Senior Associate Pastor of the cesspool known as Bethel Church in Redding California. Kris Vallotton is at it again beloved. Poorly taught and led by mega-heretic Bill Johnson, Vallotton has plenty of profane beliefs to choose from when he takes pen to paper. Bethel is ground zero for the New Apostolic Reformation as well as the False Signs and Lying Wonders network of churches. Gem stones, gold dust, angel feathers and the original fake glory clouds are all claimed manifestations from Bethel's wickedly deceptive heart. Vallotton is the co-founder of a school for supernatural ministry, where they teach the gifts of the Holy Spirit, which of course is a biblical impossibility. Bethel is the home of a "dead raising team" that claims 15 resurrections without a shred of proof as well is the horrific "grave sucking" practice. Amidst these various affronts to God however is an underlying false prosperity gospel. This blog post reaffirms that there is no low that Vallotton and Bethel will not stoop to in order to sell God out for their personal benefit. 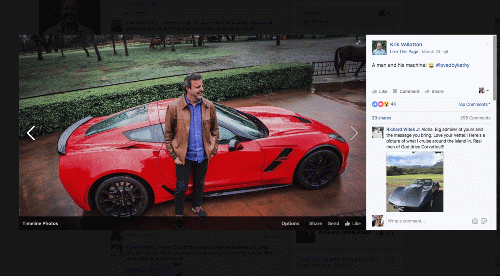 The picture above is Vallotton showing off his new sports car on Facebook. The man simply has no shame. Let us once again reason together as we walk through what Kris thinks are the eight differences between wealth and poverty thinking. For years I have spoken against the prosperity gospel and early on when asked if that meant I believed God wanted us to be poor I would always couch my answer. "Well of course not" is usually how my tepid response would start. The more I read the Bible the more I realize that the answer beloved is yes. If the question that is burning in your heart is does God want me to be poor then the answer is a resounding yes. Why? Because that is where your heart is obviously. The problem with the rich young ruler was not that he was rich but that he valued money more than God.